Start of winter and time to hot wax the backcountry skis with glide wax on tip and tails, and to treat the kick zone scales with Easyglide wax. 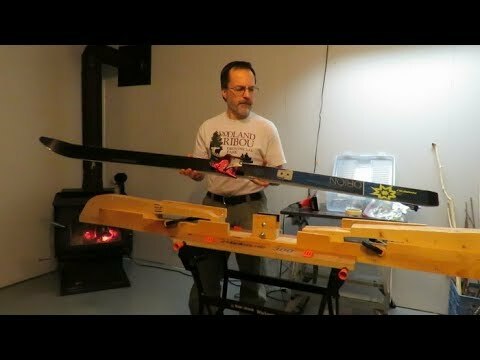 In this video I show my method of hot waxing skis, but please note I am not a pro ski technician, so this is not a "how-to", it's just the way I do it. For an accurate how-to instructional video, please watch/listen to the pros who do this for a living. I also show my home-made DIY ski vice, which was designed for narrow track skis and wide backcountry skis, fully adjustable. This is the same ski vice that is pictured in the e-book above under Backcountry Skiing/Waxing and Waxless. For this type of work and ski base repair jobs, I think it is important to have the skis secured in a vice so that you have hands free to work on the skis efficiently, and the skis don't bounce around. A ski vice can be purchased from ski stores if you don't want to make your own. Mine is heavy and not portable, so its meant for home base. It was cheap and relatively easy to make with basic tools (drill, electric jigsaw, hand saw, chisel, hand clamps, and common hardware store hardware). Now if I could pry myself away from my computer and get out of the city, it's time to get out into the backcountry for some skiing! Hoop, that ski vice is a work of art! Beauty. Nice video. I don't have as much space, so I use a different system for waxing: two inverted wooden T's with a bicycle inner tube stapled to the top for grip. It works reasonably well (and I wax the skis for the whole family). Secured with two clamps to the workbench (my kid's ski on top). An (albeit less elegant) option, for people with limited space. As an aside, if anyone isn't waxing their own skis - try it! Really easy and therapeutic (like knife-sharpening). Wonderful activity for a Saturday night! sorry if missed it, what wax do you use? Hi h_t. For the glide wax, I ironed on a Vauhti glide wax -8 to -25C on tip and tail. For the fish scales kick pocket, I used Swix Easy Glide liquid. Your way ahead of me. I'll start waxing my skis next week. Interesting clamp for your skis. Good video Hoop. I think I am going to have to make a vice now.